This is a project designed by Historyworks to complement and extend the work started in the Abbey area, because it is funded by the Arts Council England (administered by the Norwich and Norfolk Festival Bridge) and local company of international stature on the Newmarket Road, Marshalls, and is designed to engage young people and the wider community with a STEAM approach to creativity (Science, Technology, Engineering, Arts and Mathematics). To this end, Historyworks has put together a collaboration with the sculptor, Matthew Lane Sanderson; the songwriter for CBBC's Horrible Histories, Dave Cohen; the musicians/choir coaches/junk band leaders of Mario Satchwell, Tizzy Faller, Bethany Kirby. We have organized fieldtrips to the Cambridge Museum of Technology with STEM sessions which focus on friction and forces, making hundreds of balloon-powered wagons. We've offered singing and recording sessions for schools in walking distance of Marshalls Aerospace this year, namely Abbey Meadows, St Phillips CoE Primary, and St Matthews. With them, we've rehearsed and performed with choirs and Year 5s and school assemblies new STEM focused songs on Cambridge scientists, such as Rosalind Franklin, Charles Darwin, and the Jurassic period Flying Pterosaurs which used to soar over Coldham's Common. In addition, to help the Year 5s engage and understand the science of gravity, we also have the newly commissioned Historyworks song, 'One Red Apple', and a song about Marshalls flying machines, which starts 'My aeroplane flies over the Ocean, Why does it not fall in the Sea? Next year, dependent on the Marshalls project, we hope to include other primaries close to the perimeter of the airport, Fen Ditton Primary and Teversham Primary. For youngsters in the summer holidays, Historyworks organized a series of FREE workshops which were hosted at Abbey Meadows Community Centre. For the modelling aspect of the workshops, Helen Weinstein purchased a set of 'kite kits for schools' so that all of the participants had the opportunity to make an easy-to-assemble child sized diamond kite to take home and fly with us at the event in August on Parker's Piece. Importantly, we were joined for one afternoon of the workshop by the sculptor, Matt Lane Sanderson, who showcased how to work in wire, with everyone making a wire 3-D sculpture; and also with a briefing from Helen Weinstein about our 'flight' theme, Matt came up with a design for a glider, and all the children had a great time designing their own gliders and learning to tip the wings to fly them at different speeds and heights. For more information and glider photos please go here. For the music and junk band aspect of the workshops, children made shakers with Tizzy and Mario and Bethany, and then learnt to play these rhythmically, and watch the conductor carefully as they added more tones from other objects, such as pipes and tubes donated by the sculptor, Matt Lane Sanderson; plus tubs and bins and beaters with low and mid notes donated by the Cambridge Scrapstore. After a series of afternoon workshops, a performance was put on for parents and the wider community; and also following on at the Big Wednesday on Coldham's Common. For the report about the Junk Band workshops, please read our blog report here. Historyworks organized a community event on Coldham's Common to showcase our Junkband and invite the wider community to come along for drumming workshops, and to join us for making marvellous machines: to make kites and gliders for older children, and flying ptersosaur kits for younger ones. It was great to team up with ChYpPS and Abbey People to make this a 'Big Wednesday' event in the ChyPpPS summer calendar, the first time one has ever been held on Coldham's Common. ChyPpPS laid on face-painting tent, and organized circus jugglers, outdoor trampolines, pop-up tennis, and a Cambridge United Sports Zone and fun-run. For many families, it was the first time they told us they had picniced on Coldham's Common and had an excuse to hang out there and enjoy this wonderful open space in their community. Our other partners from the Abbey People community helped with learning about the wildlife on the common and the community orchard at the Margaret Wright Orchard nearby. Further, partners from the Cambridge University Museum service came along to run activities and object-handling sessions. By special request from Historyworks, the Sidgewick Earth Sciences Museum brought along objects to represent the Jurassic period findings on Coldham's Common, a *new* story we've been sharing with the children and the community through song and poetry, and the families attending hugely enjoyed seeing and feeling coprolites, the fossilized dung from our flying reptiles! To read the report about the Coldham's Common event and see photos of the community enjoying this fantastic sunny afternoon of music and making and sporting activities, pleaes find our illustrated report here. 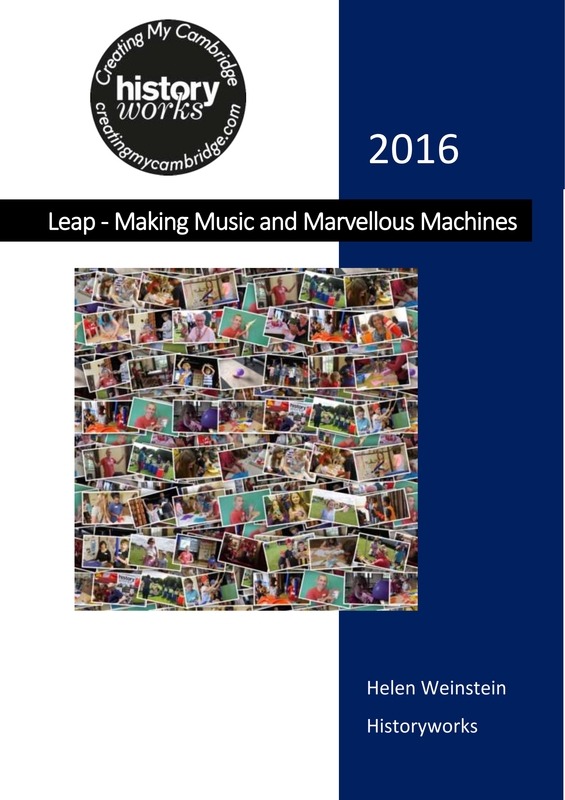 For 2017, we've plans with the Marshalls Project in the Abbey area to extend our making and marvellous machine workshops to go into schools for Science Week in March 2017, and then to run a series of 'popup' workshops in conjunction with ChYpPS in the summer term in the run up to a repeat event on Coldham's Common, this time with a 'mass' kite fly of Pterosaurs, which we hope that the sculptor Matthew Lane Fox will design for the event. Also, there is a need in the Abbey area to run a local history memory-making series of workshops to tell the story of each neighbourhood in the Abbey area which we suggest to the Marshall's Wing project could commence in 2017 and run into 2018, to capture photos and memories of the building and development of the area from the Victorian period onwards especially. This may feed nicely into the proposed project in Abbey for a community tapestry, like the Bayeux Tapestry, telling the story of each era of the Abbey area in stitched tableux. Lastly for 2017, we would like to run a 'Fun Palace' event for the national play day of 'take-overs' of local museums and heritage sites by young people at the Cambridge Museum of Technology perhaps, and run this with local partners at the Cambridge United Stadium and at Marshalls itself for making 'flight' and rocket themed workshops for the wider community.... We will keep everyone posted on what is going to be possible for 2017 to 2018 ! !